I read this as part of the Aussie Author Challenge, I’m only reading three books in the challenge and this is my second one. Ellie and her friends leave home one quiet morning, wave goodbye to their parents, and head up into the hills to camp out for a while; seven teenagers filling in time during school holidays. The world is about to change forever. Their lives will never be the same again. Would you fight? Would you give up everything? Would you sacrifice even life itself? 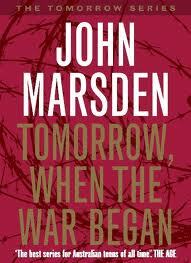 I first read Tomorrow, When The War Began by Australian author John Marsden back in high school and it’s odd to me because I remember the premise, but have forgotten so much of the story itself that the second time round it’s like reading it anew for me. I even thought I had not read the rest of the series at all, but discovered that I actually have. The point is it was like reading it for the first time so that’s how I’m going to be reviewing it. I finished it last night after reading for only a couple of days. John Marsden has a way of writing that is very engaging and absorbing, but I don’t know how much of that is his writing story and how much of that is the character Ellie who is the narrator of the tale. Either it is really well written and easy to relate to even when you haven’t been in that situation. I love how the characters, unlike in a lot of survival novels, go through a realistic set of emotions in a realistic amount of time and that they’re all so well written that they come across as individuals. Tomorrow had a chance of being frustrating being told in the first person because of information you could possibly miss out on, but Marsden has found ways to introduce that information so it doesn’t matter that it’s not in third person. This is something I was grateful for, but at the same time found it a little bit too convenient and I did have a problem with characters feeling certain emotions so quickly (I won’t say what to avoid spoilers), but that’s something I can’t stand in most stories. Other than those parts it’s a great novel, raises some very interesting moral and ethical questions, and it’s definitely a young adult novel that I can actually recommend to young adults. I’m also really excited to see this at the movies when it comes out (which is one reason why I have re-read the book), I just hope they actually do it justice even though I can already see slight changes in the trailer. I recommend not watching the trailer unless you’ve read the book or plan on not reading it. Reminds Me Of: Nothing actually springs to mind that I’ve read as I don’t read that many war novels or watch war flicks that have to do with young adults. Great review. Hope the movie lives up to your expectations! Thanks and me too. Thank you for dropping by!